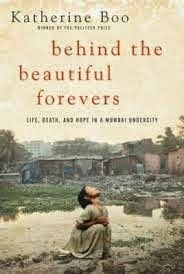 a book chick: "Behind the Beautiful Forevers"
my take: I put off starting this because it's nonfiction AND it's India. It was obvious to me it was going to be an emotionally tough read. I'm not sure what possessed me to start right after Christmas, but there you have it ~ in the dark mid-winter I went into the slums of Mumbai. The title comes from the advertisement for Italian tile that's on the wall behind which the illegal squatters have built their vast slum near the international airport (Italian tile is beautiful forever). Very well-written and I thought very readable because Ms. Boo personalized the enormous poverty and injustice by following a few real people over several years. The rub into my own life happens when the author shows how the global economy affects those on the very bottom of the economic food chain ... here's in inside view of how trickle down economics really works. I think it would be insightful for those who get to make decisions that affect such people, especially when a possible closer alliance with India and the US is on the horizon. Your first sentence = why I skipped this book club meeting... I really probably should read it though.